Aside from the alphabetical sequence, little is predictable here: there’s no telling which of the titles will hold forth, and every time one of them does it tends to perform a little trick of its own. I begin to see a series of animated personae in the entries of Encyclops, pushing the book towards another life, a time-based performance enacting a playful tension between utterance and silence. 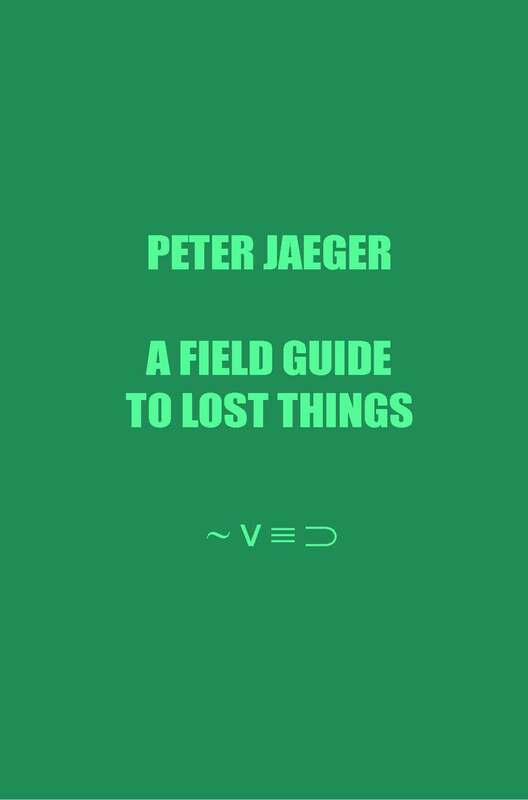 Recent if p then q author Peter Jaeger gives a short explanation of his book A Field Guide to Lost Things in the latest and special Canadian issue of the Volta. if p then q is an experimental poetry press which has been publishing cutting edge work since 2008. This event is a chance to both launch the latest crop of if p then q titles and celebrate the final night of Steven Fowler’s Mahu exhibition at The Hardy Tree Gallery. As well as performances by Nathan Walker, Chrissy Williams, Stephen Emmerson and seekers of lice, the event will feature a special, not to be missed, 3 hour performance by Peter Jaeger, as well as a collaborative art workshop with artist and director of The Hardy Tree, Amelie Russell. Stephen Emmerson’s books and objects include: Telegraphic Transcriptions, a never ending poem…, Comfortable Knives and Pharmacopoetics. He co edits Blart Books with Lucy Harvest Clarke. https://stephenemmerson.wordpress.com/ He has two if p then q publications – the very limited Stephen Emmerson’s Poetry Wholes and the upcoming publication Family Portraits. I wonder, of course, if reading is really reading (versus, say, scanning) if there’s no time to consider what is being read. 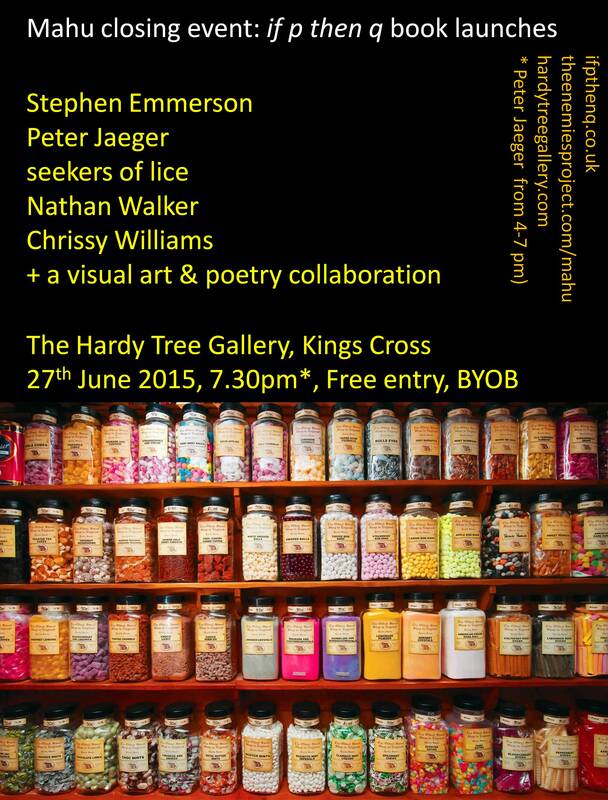 Peter Jaeger is a Canadian text-based artist, poet, and literary critic now living in London. He is the author of eleven books, and his most recent publications include John Cage and Buddhist Ecopoetics (Bloomsbury 2013), 540493390 (Veer Press 2014). He has also shown bookworks and performed his work at various galleries and art festivals, including MACBA in Barcelona, the Whitechapel Gallery and the ICA in London, the Arnolfini Gallery in Bristol, and in Turkey at the 12th Istanbul International Biennial of Contemporary Art. He is Professor of Poetics at Roehampton University in London. Zone of Heat A cave of warmth dug out of the heart of the room itself, a zone of heat whose boundaries were constantly shifting and altering in temperature as gusts of air ran across them to strike freshly upon my face, from the corners of the room, or from parts near the window or far from the fireplace which had therefore remained cold.